So, just what is Wireless Internet? 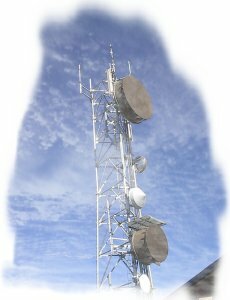 High Desert's Wireless Internet uses microwave radio signals to deliver high speed data to your home or office. Imagine being connected to the internet with instant access 24 hours a day, 7 days a week. With the addition of a special network card to your computer and an antenna outside, you can be PART OF the internet. Our Wireless system is designed to cover the areas "left out" by DSL coverage and Cable Modem coverage, giving Rural customers the same type of performance enjoyed by those in the cities. Is this the same as "satellite" internet? No! Our Wireless Internet is bi-directional like some satellite solutions, however since the distances covered are much smaller (40 miles vs 44,000 miles with satellite) the response times are much better. The industry term for response time is "latency". With existing satellite solutions these time are as high as 6 seconds, while our Wireless system is typically under 50ms (IE: 1/10 second)! Some satellite solutions do not allow more than one computer to be connected to the dish, and do not allow FTP uploads, preventing all but general browsing of the Internet! We pride ourselves on some of the fastest web hosting in the industry. We do this by NOT Congesting our servers with 300 + sites per server. And we also use a cross platform system Windows 2003 and Linux as to provide whatever flavor of server you prefer. August 1 2002: High Desert Internet Services Is Open For Business. August 20 2003: Come View The Start of our Photo Album. August 1 2002: North East Sparks Now Up & Running. August 3 2002: Fernley, Desert Springs area Access Point Now Up & Running. Black Springs Are Now Up And Running. May 30 2003: Now servicing Silver Springs area. April 1 2003: Now servicing Stagecoach Mark Twain/Dayton area. June 20 2005 Now Serving Carson City, Mound House Areas. July 14 2009 Now Serving Yerington, Wabuska, Mason Valley, Smith Valley-Wellington.